Archeological and literary evidence indicate that during the Anuradhapura era from the 3rd century BCE to 10th CE, there were as many as 74 Buddhist shrines and Buddhist historic sites within the area presently demarcated as Trincomalee district. These include the Wilgamwehera Rajamaha Vihara and the famous Seruwawila Rajamaha viharaya, located in southern Trincomalee district. It is noteworthy that there were thriving Sinhala Buddhist communities associated with all of these Buddhist sites. Irrigated rice farming was the basis of livelihood in these settlements. Irrigation facilities included reservoirs and canals built in the past by Sinhala kings. The Trincomalee district is one region that symbolizes the unique heritage of Sri Lanka which was known in ancient times as a kingdom of tanks. It represented all types of ancient tanks and irrigation systems. According to the agro-based ancient culture, the tanks fell into three categories – the smallest was theGaamika wewa, which served a single village. The medium was the Daana wewa which catered to several villages while the largest was the Maha wewa which covered a large area known as a Koralaya – a division of a province. The story of these ancient, well-conceived irrigation schemes established by Sinhala kings of the past and that of the Sinhala farmers is most distressful. The invasion of the country by Kalinga Maagha the Tamil terrorist invader of the 12th century and later the European colonial invaders – the Portuguese, Dutch and British destroyed these irrigation works in order to disrupt the self-reliant livelihood pattern of the Sinhala people. These ancient tanks built by Sinhala kings, had not been repaired for well over hundreds years. Later, Tamil terrorism of an extended period of time, led to the neglect of irrigation facilities upon which the livelihood of the indigenous Sinhala farmers were based. Tamil terrorists permitted Muslims to encroach the lands abandoned by the Sinhala people. While some of these Muslims adopted farming, others began raising cattle and grazing them in large herds in lands abandoned by the Sinhala community that traditionally occupied these lands. Trincomalee was a region where Tamil terrorism was rampant for some three decades. The Sinhala community was subject to severe atrocities by Tamil terrorists during this period, which eventually led the large majority of Sinhala people to abandon their traditional villages, farms and ancient Buddhist shrines, and move away. The same was true of Buddhist monks who inhabited these shrines. In 2012, the previous government, launched a major programme to renovate and repair 52 ancient irrigation tanks in the Trincomalee district starting with the Kudagalmitiyawa tank, however, with the recent change in government this project is at a standstill. 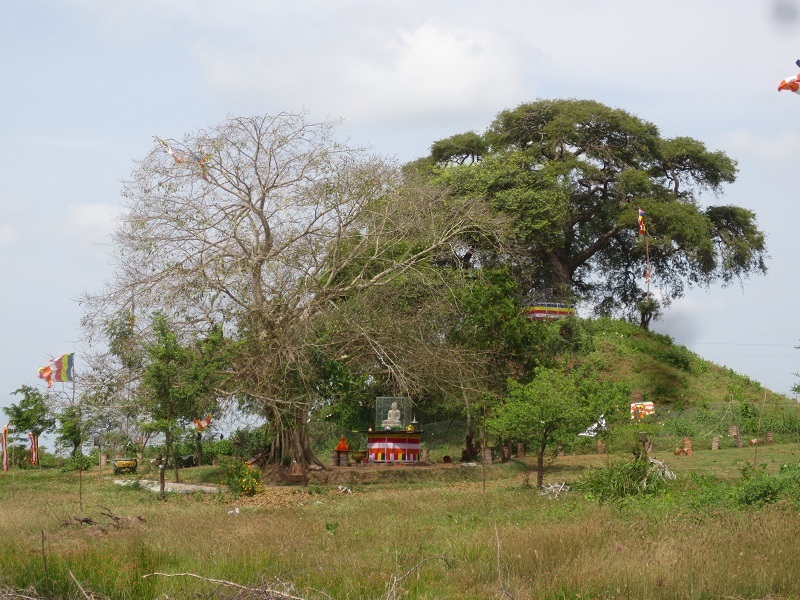 Wilgampitiya vihara site is located about six kilometers away from Kenniya and about a kilometer off the main Trincomalee- Seruwawila road. Kinniya is a sub-urban town of Trincomalee, known for its hot water wells and the archeological remains of an ancient Buddhist vihara site. A rock foundation of an ancient stupa is found in this site. 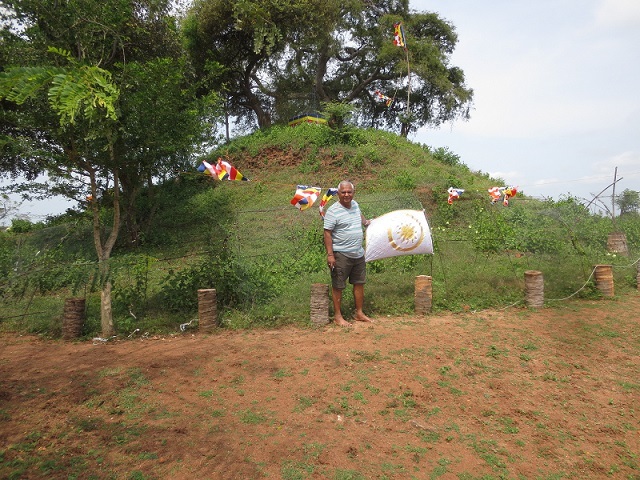 This was an important Buddhist site in ancient times inhabited by a large Sinhala community engaged in farming activities. Tamil terrorism and plunder led to a greater part of the Sinhala community abandoning this region. In later years, the Tamil terrorists permitted Muslims to settle down in these abandoned villages. Today, Kinniya is inhabited predominantly by the Muslim community. The new bridge of Kinniya is the longest in Sri Lanka and was built with Saudi Arabian funds and replaces the old ferry service across the Kinniya lagoon. Wilgamvehera Rajamaha Viharaya is a highly important Buddhist site which contains remains of the oldest Buddhist shrine-monastery complex in the Trincomalee region. It was built in the 3rd century BCE, by Devanampiyatissa, the first Buddhist King of Sri Lanka. Among on-site archeological remains are the remains of an ancient stupa in the form of a hill with a few large trees and dense vegetal cover. There are some rock pillars and a rock inscription. The remains of this ancient Wilgamvehera stupa and other important archeological remains are located within an extensive, open, low-lying area which is used at present for grazing of large herds of cattle, predominantly by Muslim villagers living in the neighborhood. Wilgamvehera viharaya was not often visited by Buddhist pilgrims who visit Seruwawila Rajamaha viharaya, whose numbers have increased significantly since the eradication of terrorism in 2009. Inquiries made at random from Buddhists living in the immediate neighborhoods of Wilgamvehera and at Seruwawila Rajamaha viharaya revealed, that in the past several decades, there have been many instances of Muslim encroachment of lands that belong to Wilgamvehera. This has resulted in the wanton destruction of ancient Buddhist monuments and items of archeological value found in the neighborhood of Wilgamvehera. Vihara lands have been used illegally by Muslims for a long period of time in the past. They continue to use this land freely for grazing of large herds of cattle meant for slaughter. Although there was a sanghawasa building, we did not encounter any resident monks during our visit to Wilgamvehera in May 2015. We were told that in general, most Muslims in the area, have not been in favour of the revival of Buddhist activities in the region, including the recent increased arrival of Buddhist pilgrims and bhikkhus and the restoration work initiated in Wilgamvehera in recent years. Since liberation , 2008 onwards, what has Sinhala Buddhist leaders have done to this important Buddhist venue ? The least people can do is VISIT these places, donate to monks and Buddhists living close by. MR and Maru Sira didn’t even RESETTLE SINGHALA people in the north and the east. What else can we expect! They were both busy APPEASING Ts and Ms. He even promised TRINCOMALEE Muslims a FREE HAJ pilgrimage funded by the govt.!! It is the KINNIYA-MUTTUR bridge that brought too many of them to SERUWILA. Ts and Ms are KING MAKERS in SL. SL leaders just PANDER into their demands. 13 amendment giving all these to the provincial council administration, the future is even BLEAK. SL has NO REAL patriotic leader in sight. IF SL had any politician with AN IOTA OF PATRIOTISM, he will demand to SCRAP 13 amendment. GR and Lalith Weeratunga demanded SCRAPPING 13 amendment but they are powerless. All others are trying to send Mother Lanka to NIRVANA! “ithin ayubowan Lak mavuni karu”.